The TFC goes way back to the beginning of the MMA scene in Chicago. Total Fight Challenge 1 took place in 2004, but long before that it was called the JKD Challenge. Fighters like Matt Hughes, Mike Russow, Keith Wisniewski, Joey Gilbert and others cut their teeth in “No Holds Barred” MMA at the JKD Challenge. In fact, Matt Hughes first pro fight was at the JKD challenge. 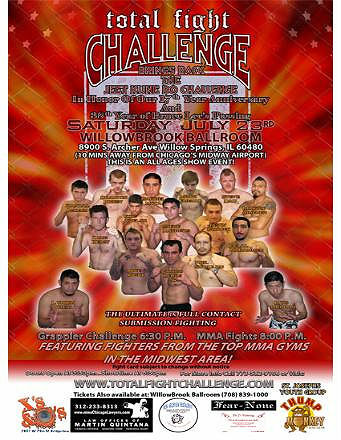 So to celebrate our 17 years of producing MMA shows, TFC is bringing back the JKD Challenge for one night only for an all ages show on July 23 at the Willowbrook Ballroom in Willow Springs. Call 708.839.1000 to get your tickets.